The grape variety used in the production of this wine is Semillon. This grape is picked exclusively by hand. To obtain the “noble rot” – not to be confused with wine writers’drivel – we go through the same vines two or three times, choosing with meticulous care the bunches of grapes which have reached maturity. As a result of a fungus, called “botrytis”, this grapes become withered and take on a characteristic purplish colour, but unfortunately not all the bunches are affected at the same time : the harvesting period can thus extend from 15 October to 15 November. To select the grapes, it is necessary to have been trained. Their visual aspect is important; sometimes it is necessary to take one’s professionalism to the point where one tastes a bunch in order to dispel a doubt… It is a question then of a true craftsman’s wine, demanding and unfailing attention and providing very few bottles each year. Sometimes, when climatic conditions are catastrophic, it can even be that there is no crop at all! 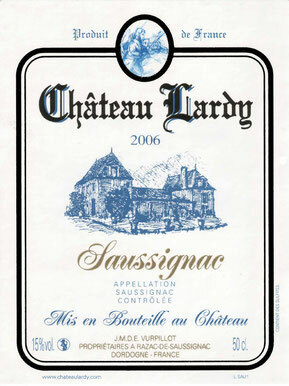 Once the vinification is finished, the Saussignac wine remains in barrels for a year. During this “magic” period, it clarifies naturally. Winter passes and, under the influence of the wooded tanins, the wine clears and the deposits are precipitated to the bottom of the barrels. The nectar then acquires the amber colour which makes it known as “The Gold of the Périgord”. 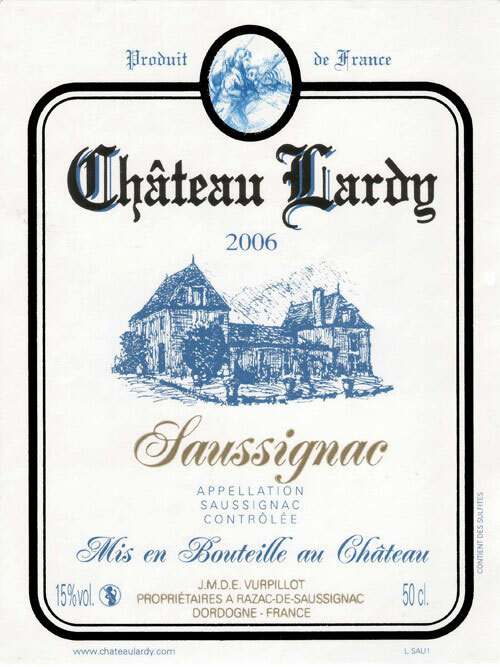 With its incomparable nose, it can be said without false modesty that Château Lardy produces one of the most celebrated sweet wines of the region, rivaling with the best Sauternes. Between 6 and 8 ansyears. As a aperitif, with foie gras, or as an accompaniment to dessert. Roquefort can also go well with Saussignac, but not necessarily with other blues. It is a sweetness of the wine that complements the saltiness.